I regularly make excuses for not exercising in the morning. One of my best ones has been that the weights are too hard to get to without the help of husband (seeing as they were hiding in a box, under another box, under yet another box). I also regularly complain when the weight box is on top of all the other boxes, since I can't reach my crafty goods boxes underneath. With this "Organize It" project, I decided to nip my excuses and complaints in the bud (or buns as some buns of steel would be nice) with a DIY weight shelf. Husband is the one who cleverly came up with this idea (I'm sure he was annoyed with my excuses/complaints). 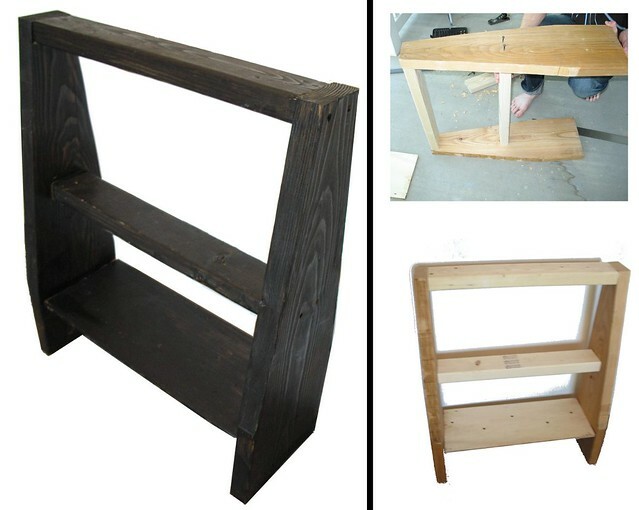 It's a simple design and we made ours with some scrap wood from previous projects (including the DIY bed frame). 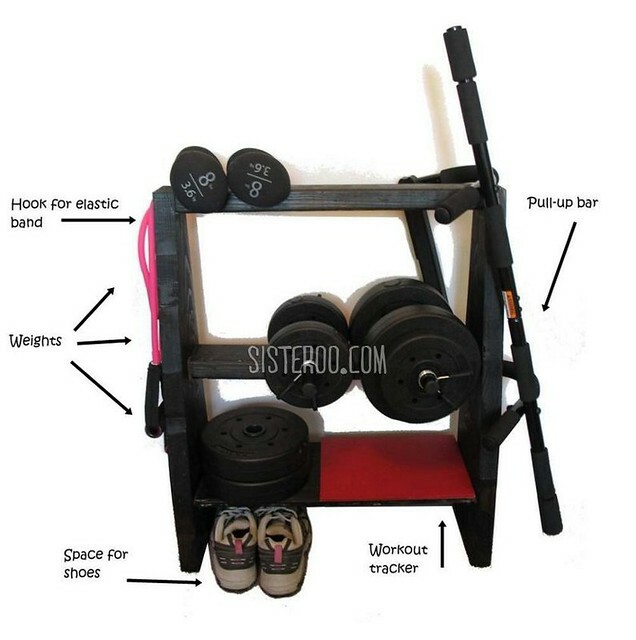 With some wood, screws, and a little paint you too can organize your way into more regular workouts. We started with a 58 inch 2x10 board (which really is only 9 inches wide, something you'd know if you work with wood...which I don't). 1) Cut the board in half, so you end up with two 29 inch tall pieces. 2) Decide which end is the top and which is the bottom. 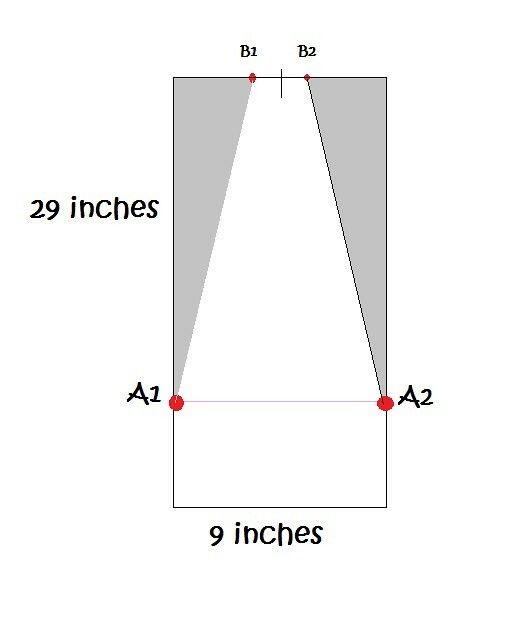 Measure 8 inches from the bottom and mark it with a line on each side (Now called A1 (Left) and A2 (right)). 3) Find the middle of the top. Measure out 1.75 inches on each side of the top. Mark it (Now called B1 (left) and B2(right)). 4) Connect the lines: A1 to B1 and A2 to B2, then cut on those lines. These are the two diagonal lines that make the piece small at the top and wide at the bottom. For those of you who just want the numbers, the side pieces are 3.5 inches at the top and 9 inches at the bottom. The diagonal cut began 8 inches from the bottom. Figure out where you'd like your shelves (dependent on the size of your weights), mark the spots, place the boards, and drill them in! Feel free to add a little paint like we did for a cleaner look. You can also add a screw on the side (half way out) to hold elastic bands. And there you have it--no more excuses! Looks great; such a clever design. I love this, Shrink! I struggle with the "weights stuck in boxes" problem too. I'm adding this workout station to my immediate "to-do" list! Glad you both like it! It's proved to be very sturdy and handy thus far. This now takes away my excuse for not working out! Such a great idea. Thank you for the tutorial-I am going to make one for me!